"AotC is the best Star Wars because it didn't portray the Clone Wars the way you expected it!" They basically said as much this week at CinemaCon in Las Vegas. The problem with the prequels has always been it's a story we know the ending to, and being blunt George Lucas failed to make the audience care about the fall of Anakin Skywalker. I've said it before, the biggest misstep was having us meet Anakin when he was a child. Anakin should have been the Han Solo-style rogue who was already an established pilot when he crossed paths with Obi-Wan and who already had some blood on his hands. Taking us through Anakin's entire journey to adulthood was unnecessary and frankly gaffed the plot. Though credit where it's due, Lucas tried to beat Martin to the punch in squicky relationships. I've always maintained TLJ is going to age better than the other films in this newest trilogy simply because it dared to do what the franchise hasn't done in over thirty years and that's put the story in a place no one is equipped to say with certainty how it ends. 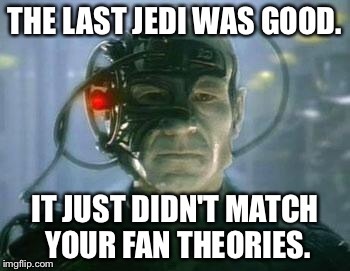 Rian Johnson got the full force of the Star Wars fandom's ire for messing with formula after Abrams got the full force of the fandom's ire for adhering too close to formula. That being said, TLJ was far from a flawless film and I can't disagree with Mark Hamill's frustration with how the character of Luke ultimately panned out. It makes sense from a narrative perspective in the context of the story the movie was telling, but from how we've come to understand this character in forty years of media it really was akin to hearing Peter Cullen bellow out "GIVE ME YOUR FACE!" while tearing a Decepticon in half. Luke went out spectacularly well in a blazing triumph of the adherence to the Jedi Code vs Ben's raging hate for the past and tradition, but getting to that point was painful to watch I won't deny. I don't want to ascribe directorial intent to something that might have just worked out in post, but I'd like to think making us (and the actor) uncomfortable with where Luke ended up was intention, to make us cheer all the louder when he did return to form at the end. The Casino planet...I get it. Finn needed something to do. That sequence wasn't it. Just didn't work and I will fully admit to just skipping those scenes entirely when rewatching the film. About as interesting as the Senate deliberation scenes in the Prequels. Ben and Rey remain the best part of the new trilogy. Where Lucas fell flat with Anakin and Padme, these movies are killing it with these two characters. Ben and Rey's team up fight isn't not going to make me bounce in my seat like a excited three year old for a long time to come. Beautifully choreographed DANCE ROUTINE turned fight, with no ridiculous over the top maneuvers. The New Trilogy has the best Lightsaber battles of the entire franchise. So...yeah. Episode VIII has problems, problems people deserve to voice and be legitimately bothered by (Though I continue to laugh at those who feel somehow threatened by Rey as a character). But two movies in and as pieces of entertainment, they're still head and shoulders above Lucas' prequel trilogy in terms of characters and overall story. Story pacing, however...I'll give to AotC. Every scene in AotC advances the plot, where as TLJ the war profiteering subplot just felt like Johnson was deliberately throwing out a parachute to slow the story down. Not my feelings, but I feel this is related. Also I agree with Rust that the Rey and Kylo versus the Praetorian Guards is one of the best (if not the best) lightsaber battles in all the films. I disagree about that one. It was competently filmed, but there was zero tension in that scene. I simply didn't care what happened. I guess the problem wasn't with the duel itself, but with the setup. There's rumor that IX will have a zero-g fight on top of Kylo's spaceship, which sounds pretty neat. Always wanted to see something like that since hearing Vader's suit was made to explain him hoping between ships. Considering my feelings for the other sequel films, I predict that this film will have some elements I really like, and some thing I don't like. This film will have some confusing/vague world-building that will make me unsure whats happening in the film, and what these events mean in-universe. I say that because it happened in the other two (for TFA it was "who are all the factions, how do they relate to each other", for TLJ it was "Did the First Order conquer to galaxy in a day? What does the destruction of the galaxy's main governmental power mean for the rest of the galaxy? What about the members and world of the New Republic who weren't blown up by the Death Star knockoff?") My guess is for this film, it'll be questions about the First Order what they control, how they operate, and how they end up getting beaten. Personally I find myself disappointed that the status quo of the Sequels is "the Heroic Rebels versus the Evil Empire" again. I guess they could have had another type of war, but they didn't. I get the feeling of been there, done that. There was an opportunity to do something new but they decided to play it safe. Eagerly awaiting Episode IX name, poster and maybe trailer from the SW Celebration panel at 12 today. Loved Force Awakens, Thought Last Jedi was even better, easily one of the best SW anythings ever. Can't wait for a look at what's next. Now that we got the obligatory ZacWilliam1 love fest and Superomegaprime hate fest out of the way, I'm hoping for an exciting trailer. It might be exciting but this is pretty much the most important trailer in the history of movies because its make or break for Star Wars! Make or break for Star Wars was 2 movies ago. I like Rose's look in the film. A little more generic, but nice. I do wish there was a little more to Rey's outfit than a more simple and lighter version of her original, but still. Finn has Han Solo pants. I like Poe's outfit a lot. 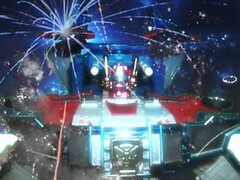 Edited by Powered Convoy, 12 April 2019 - 12:20 PM. I do like Rey's hood. That's a nice touch. -ZacWilliam, also I want toys of everything.